Each year at Christmas, Southern Baptists commit to giving financially to support international missions. Starting in 1888, the Lottie Moon Christmas Offering® was established to support the efforts of the International Mission Board (IMB), the international mission’s organization of the Southern Baptist Convention. The IMB collaborates with churches to send missionaries and missionary teams to make disciples and multiply churches among unreached peoples and places for the glory of God. Currently, there are about 4,000 IMB missionaries serving all over the world and countless mission teams sent each year. The IMB is funded primarily in two ways. First, through Cooperative Program giving. Buck Run, like many Southern Baptist churches, dedicates a portion of our budget to the Cooperative Program. The Cooperative Program provides resources to the IMB and many other missional Southern Baptist organizations like the North American Mission Board and Southern Baptist seminaries. 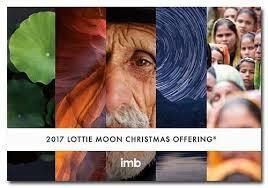 Second, the IMB receives resources through the Lottie Moon Christmas Offering®, an annual offering during the Christmas season. The Cooperative Program and Lottie Moon giving make up about 95% of the IMB’s budget. At Buck Run, we celebrate the opportunity to give toward Lottie Moon during a time of worship called Walk to the Manger. During the worship service, those attending will be able to participate as we corporately give. Walk to the Manger publically demonstrates Buck Run’s commitment to our missionaries and to Christ’s Great Commission call. This Sunday morning, December 17, we will collect the Lottie Moon offering through Walk to the Manger. As we approach Walk to the Manger, be in prayer for the IBM missionaries who share the gospel all over the world. Also, begin to pray for how the Lord would have your family give on Sunday.